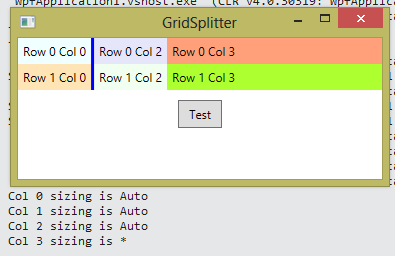 In the example below, columns 0 and 2 surround a GridSplitter in column 1. 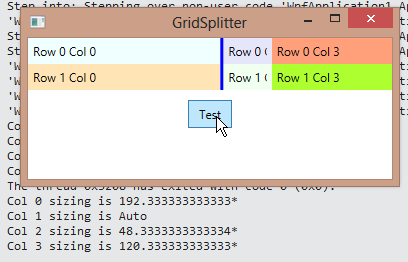 Columns 0 and 2 are set to Auto size (as is the column with the GridSplitter) and column 3 is set to proportional. Initially, we see that both columns 0 and 2 are auto-sized. 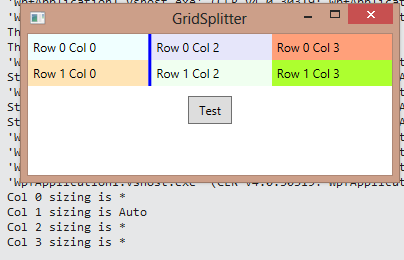 If we slide the GridSplitter to the right, column 0 changes size and switches to Absolute sizing. Column 2 remains as Auto. 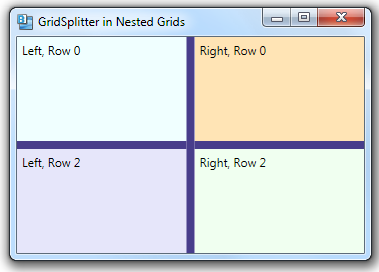 Recall that a GridSplitter in its own column and with its HorizontalAlignment set to Center will resize columns on either side of it. 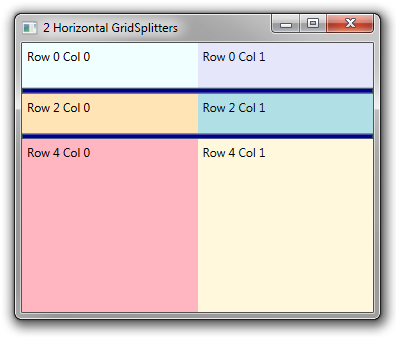 In the example below, columns 0 and 2 are resized, but the width of column 3 is not changed. 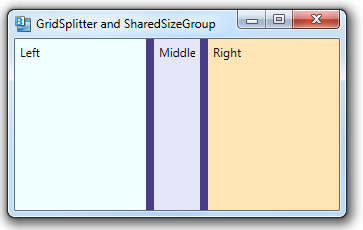 If all of the content columns are sized using star sizing, the GridSplitter will leave them as star sized, but change the coefficients to match the final size after moving the GridSplitter. We can see this by dumping out the column widths before and after our sizing operation. Before resizing, columns 0, 2 and 3 are all “1*” (or just “*”). They take up equal space. After resizing, the coefficients change. Columns are still proportionally sized, but the proportions are different. 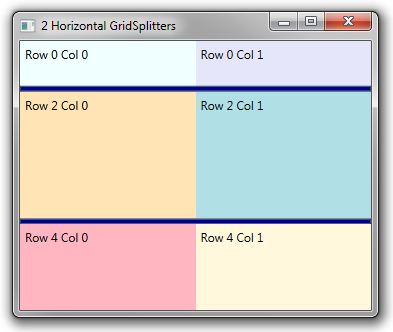 We can verify that the columns are sized proportionally by resizing the entire Grid (containing window). The columns retain their post-GridSplitter relative sizes. The most common way to use a GridSplitter is to place it in its own auto-sized row or column. 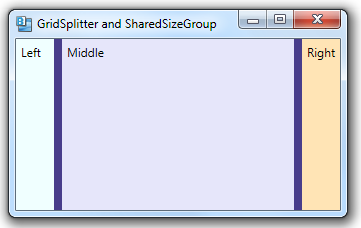 In the example below, we want a vertical GridSplitter, so we place it in its own auto-sized column. When a vertical GridSplitter is in its own column, you’ll want to set its VerticalAlignment to Stretch and its HorizontalAlignment to Center. (A horizontal GridSplitter would reverse this). 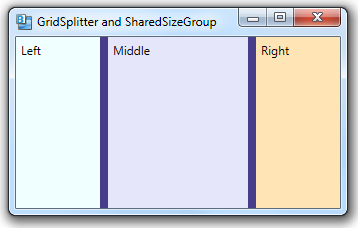 With the HorizontalAlignment set to Center, the column containing the GridSplitter does not itself resize. 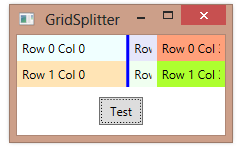 Moving the GridSplitter resizes the two columns on either side of it, which is what we want. 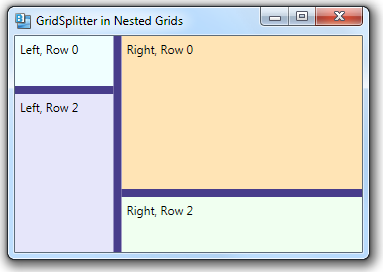 You can use GridSplitter elements in any Grid, including a Grid that’s nested inside another Grid. 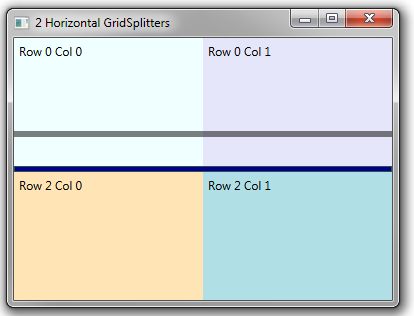 This allows you to have GridSplitters that split elements within just a portion of the screen, as shown below. 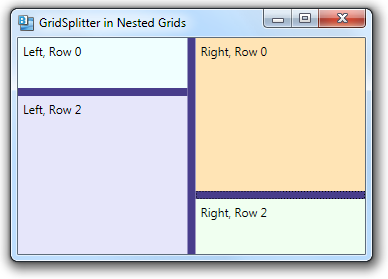 In this example, the main grid has a vertical splitter between left and right sub-grids, each of which has a horizontal splitter between top and bottom panels. <GridSplitter Grid.Column ="1" Width="8" Background="DarkSlateBlue"
By default, when you use a GridSplitter, the rows or columns that are being changed as you drag the GridSplitter are changed dynamically, as you drag the GridSplitter. 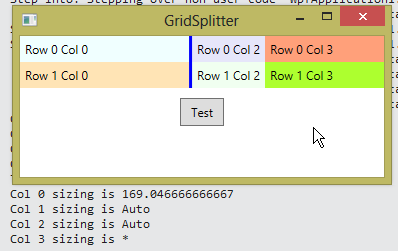 There are times, however, when you only want to draw the newly sized rows or columns after you’re done dragging the GridSplitter. You can do this by setting the ShowsPreview property to true. With ShowsPreview set to true, you’ll only see a ghosted image of the horizontal or vertical GridSplitter as you drag it. Then, when you release the left mouse button, the rows or columns will be rendered at the new size.